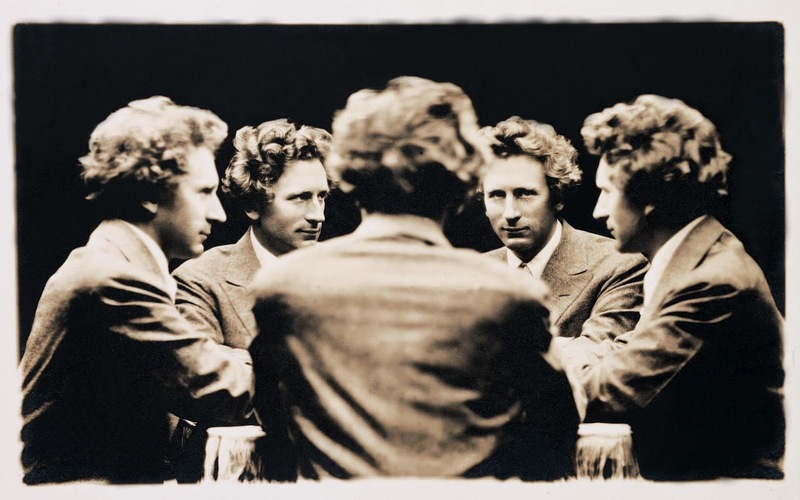 The ‘Free Music Machine’ was created by musician and singer Burnett Cross and the Australian composer Percy Grainger. 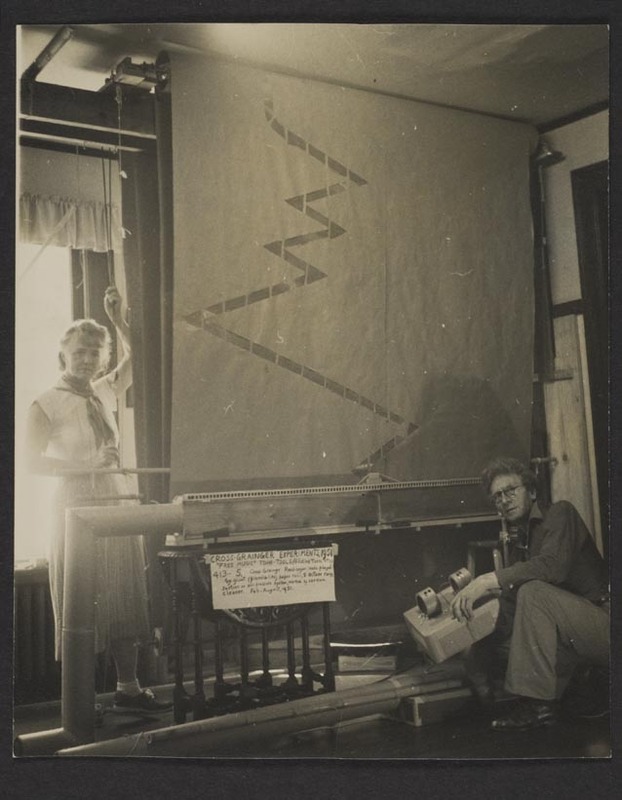 Grainger a virtuoso Pianist and pupil of Bussoni, had been developing his idea of “free music” since 1900: based on eighth tones and complete rhythmic freedom and unconventionally notated on graph paper. 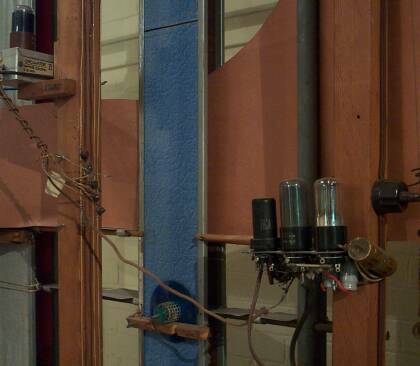 Grainger had experimented using collections of Theremins and changing speeds of recorded sounds on phonograph disks and eventually developed his own instruments. Graingers experiments with random music composition pre-dated those of John Cage by 30 years with “Random Round” written in the 1920’s. Graingers first experiments used a Pianola “player piano” controlling three Solovoxes by means of strings attached to the Pianola’s keys, this combination was abandoned as it was not possible to create a continuous glissando effect from the Pianola. 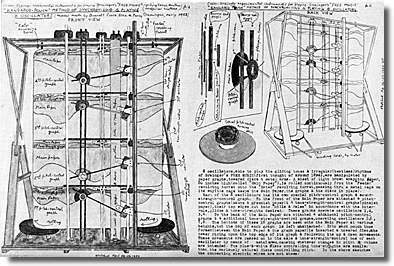 Grainger started work on a more elaborate but eccentric machine in collaboration with Burnett Cross and his wife, Ella Grainger. 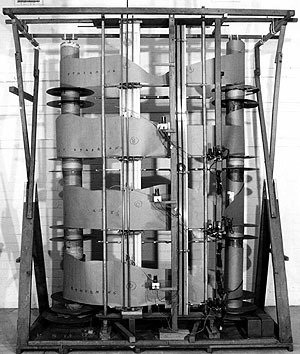 The Free Music Machine was a machine that controlled the pitch, volume and timbre of eight oscillators.Two large rollers fed four sets of paper rolls over a set of mechanical arms that rolled over the cut contours of the paper and controlled the various aspects of the oscillators. To play any pitch of any size, half, quarter or eighth tones, within the range of 7 voices. Complex irregular rhythms must be able to be performed past the scope of human execution. Dynamics were to be precisely controlled. The machine had to be to be run and maintained by the composer. 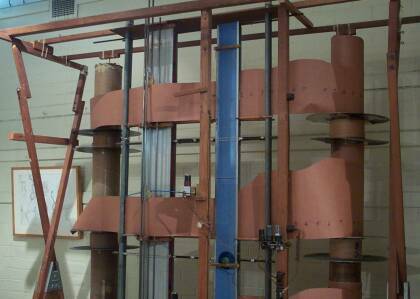 The first sliding pipes for playing gliding tones. The electrical reproducing Duo Art grand piano 1932, for beat-less music and irregular barring. The Smith’s Organ Flute Pipe, set up with hanging mops, rolling pins. The sewing machine and hand drill (to act as an oscillator for playing variable tones) October 1951. The “Kangaroo Pouch”, Grainger’s own efficient framework design with the skatewheel mountings suggested by his collaborator, Burnett Cross and four vacuum-tube oscillators built by Branch, an electronics student, from the local White Plains High School. The electric eye tone tool Cross-Grainger 1957-59, the last remaining component. Yet the matter of Free Music is hardly a personal one. If I do not write it someone else certainly will, for it is the goal that all music is clearly heading for now and has been heading for through the centuries. It seems to me the only music logically suitable to a scientific age. The first time an example of my Free Music was performed on man-played instruments was when Percy Code conducted it (most skilfully and sympathetically) at one of my Melbourne broadcast lectures for the Australian Broadcasting Commission, in January, 1935. But Free Music demands a non-human performance. Like most true music, it is an emotional, not a cerebral, product and should pass direct from the imagination of the composer to the ear of the listener by way of delicately controlled musical machines. Too long has music been subject to the limitations of the human hand, and subject to the interfering interpretation of a middle-man: the performer. A composer wants to speak to his public direct. Machines (if properly constructed and properly written for) are capable of niceties of emotional expression impossible to a human performer. That is why I write my Free Music for theramins – the most perfect tonal instruments I know. In the original scores (here photographed) each voice (both on the pitch-staves and on the sound- strength staves) is written in its own specially coloured ink, so that the voices are easily distinguishable, one from the other.